Would you like to give the gift of your time? Learn more about volunteering for the Virginia Mason Health System. Does your employer offer matching gifts when you give to nonprofits? You can increase the impact of your volunteering through matching gift programs. Assist customers, patients and staff as a volunteer at Virginia Mason’s Serenity Gift Shop. Learn more about volunteering at the Gift Shop. Develop a fundraiser of your own to give thanks, fight back against a disease, or pay forward an exceptional experience. Learn more about community fundraising. Help raise support, educate and inspire participants at our fundraising events to benefit patients and programs across the Virginia Mason Health System. Learn more about volunteering for special events. Support our region’s largest golf tournament, benefitting Benaroya Research Institute. Learn more about volunteering at the Boeing Classic. Bring your warmth and compassion as you interact with patients, families and team members. 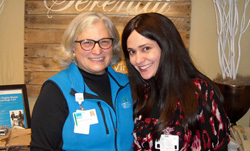 Learn more about volunteering at Virginia Mason Medical Center. Volunteering at Bailey-Boushay House is a rewarding way to help people live with dignity. Learn more about volunteering at Bailey-Boushay House. Support research by joining a biorepository at BRI. A biorepository is a biobank consisting of blood and serum samples and medical histories from people, with or without disease, who donate to advance scientific research. Researchers use these samples, which are kept confidential, to study causes, treatments and prevention of diseases such as type 1 diabetes, rheumatoid arthritis, Crohn’s disease, colitis and other immune system diseases like allergies. Learn how you can contribute to research by volunteering to join a biorepository.